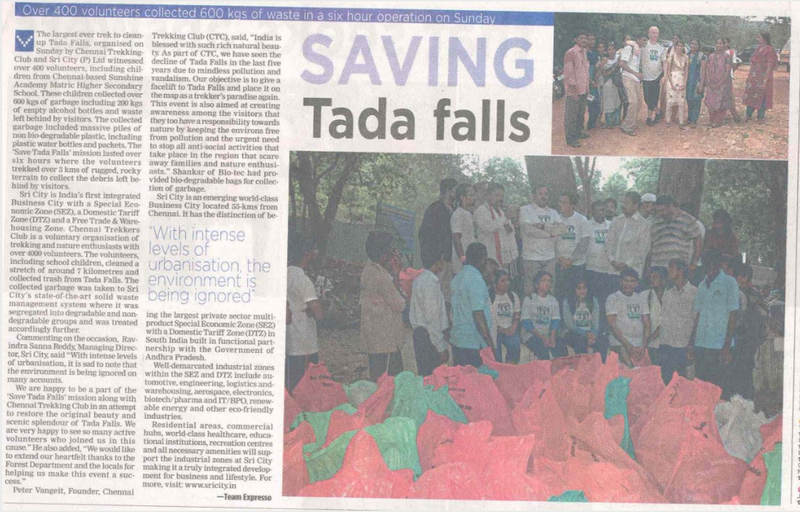 A big thanks to our 250 volunteers, including 40 school children from the Sunshine Academy who – deployed as 15 garbage busting teams, throughly sweeped the Tada stream and removed 2 full tractor loads of garbage and got a public commitment from the AP Chief Conservator of Forests in front of the local media to make Tada a zero-plastic and alcohol freezone. The CCF and other forest officials greatly appreciated our initiative and invited us to organize a similar environmental awareness event in their home-base Tirupati in the near future. Tada could be considered as the birthplace of CTC – it’s the place where we did many of our initial treks, got our initial exposure to beautiful, untouched nature, it’s the place were we first left the known trail and climbed into the mountains above to explore the unexplored which has become the signature of CTC’s treks. Tada is part of the Nagalapuram range which is CTC’s 2nd home and has given us so much over the past years. It was highly time for us to return something back to this troubled spot – it was time to expose, create awareness and preserve. We will not rest until the place we love so much is protected from any unwanted pollution and anti-social elements and preserved for future generations. As someone truly said it – we are not inheriting the nature and forests from our parents, we are borrowing it from our children. A big thanks to many, many volunteers who contributed to the organization and coordination of the event including Neetha, Thilak, Zeba, Ela, the assembly point coordinators – Balaji, Hari, Rajnith, Neetha, Sudhir, Thilak, Biju, Anand, to all the team leads – Alex, Karmu, Meena, Manoj, Ranjith, Balaji, Prital, Ravi, Bala, Hari, Biju, Arul, Marie, Ansar, Sudir, to all our photographers – Karthik, Hari, Lokesh, Nikil, Vishnu, Aswin, Vishnu, Jagadish, Shyam, Samudhiram and videographers Ram, Ramesh, Ramanujam. A big thanks to Aravind with his Ham Radio team to provide us with an essential communication backbone during the cleanup operation, to Sailaja, Kirubha, Ramya and Nitya for coordinating the distribution of garbage bags, snacks and gloves, to Arul, Thilak and other warriors (forgot the names) to walk back all the way to the parking under the hot son and supplied the volunteers with lunch deep inside the forest, to Javed and Guru for managing the parking logistics. A big thanks to the many other volunteers whose name I might not recollect but whose faces I will always remember. A big thanks to our sponsor SriCity (www.sricity.in) – Vishman, Reshma, Arthi and many, many others who arranged yummy breakfast for us, tasty biryani and curd rice, gifted us with beautiful t-shirts and provided significant visibility to our awareness campaign through posters, banners, media and forest officials. All breakfast and lunch plates/packings provided were eco-friendly. A big thanks to our long-time sponsor BioTec (www.biotec.com) who provided us with proper bio-degradable garbage bags. Thank you Shankker for your ongoing support to our preservation campaigns. This is a great job and project done.There should be more efforts to try to save the nature from further deterioration.